A Canada-based pharmaceutical company, Tekmira has announced its intention to discontinue the work of its drug for Ebola virus and change its name. The decision comes in the consideration of the company stating that the experimental drug for Ebola will fail to get the clearance in the clinical trial test. The company will change its name to Arbutus Biopharma Corp, and instead focus on experimental treatments for the hepatitis B virus. At present, the company is focused to get atleast four drug approvals for clinical development in early next year. 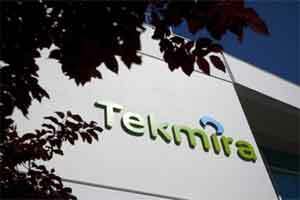 Tekmira said the new name reflects its combination with OnCore BioPharma, which it bought in March. The company says the name change will take effect by Aug. 3. Its ticker symbol will become “ABUS.”, as reported by AP. Tekmira’s experimental drugs were used in at least one patient in 2014 as an Ebola epidemic spread through several West African nations and the search for more effective treatments kicked into high gear. Other companies in the field included NewLink Genetics Corp., Inovio Pharmaceuticals Inc., GlaxoSmithKline PLC and Allergan PLC’s MAPP Pharmaceuticals unit. Shares of Tekmira jumped after the OnCore deal was announced in January, but since the end of that month they have fallen 56 percent. Its U.S. shares fell 10 cents to close at $11.18 on Monday. Its shares have risen more than 19 percent over the past year.